Memoir can be a tricky genre, with nothing holding its premise together other than the author’s truth. In Marcia Tucker’s case, being an artist and curator also makes her one hell of a writer, a woman with a keen ability to spot details and covey her passion to a larger audience. 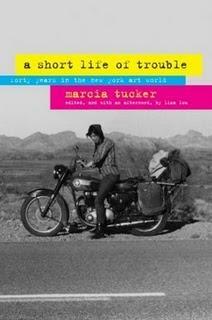 A Short Life of Trouble is a breezy, enjoyable read as it traces Tucker’s fortuitous rise through the New York art scene, parallel with the surge of second wave feminism in the 1960s. The first female curator at the Whitney Museum and the founder of the New Museum of Contemporary Art, Tucker keeps her complex narrative simple and constantly moving quickly forward. After surviving the death of both of her parents and a lover before the age of twenty, Tucker goes on to visit Germany as a Jew, take up (and forgo) painting, chat up Surrealist painter Marcel Duchamp (without recognizing him), live next door to The Band, marry, and divorce, all before the age of twenty-five. Instead of hiding inside her art world privilege, Tucker explores the deficiencies of the mostly-white mainstream feminist agenda, attending consciousness-raising groups and rallies, while encouraging her fellow female curators to do the same. In one of the book’s most memorable moments, Tucker tells then-president of the Whitney board of trustees all of the stereotypical reasons why he clearly fears hiring a woman—then gets the job anyway. Despite her frustration with it at times, of the women’s movement, she said that in thirty-five years, it had “never once lied, stolen, or cheated on me.” Much like feminism, Tucker’s life only gets more interesting as it progresses. Marcia Tucker sadly passed away in 2006, one of the rare women who managed to live an intense, captivating life while never taking herself too seriously, and finding a exemplary balance between art and politics. An example to underachievers and aimless twenty-somethings who can still go on pursue remarkable careers, she will hopefully be remembered not just as a groundbreaking curator, but also as a passionate, thoughtful feminist with a keen eye for the details in the busy world around her.